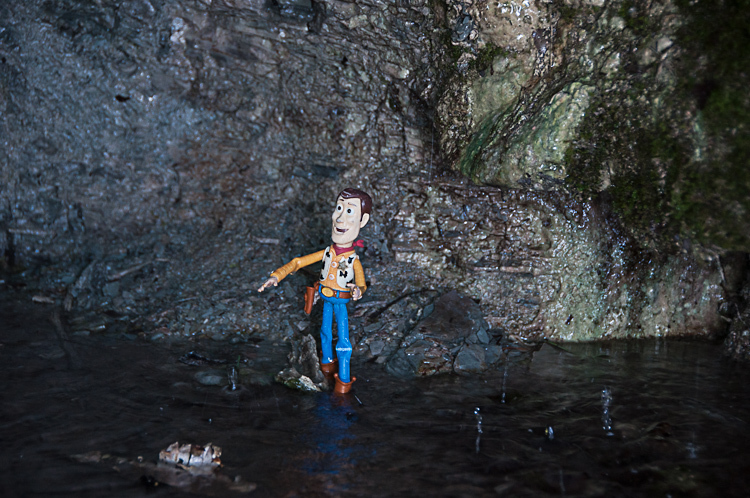 I am possibly the only person in North America who has never seen even one of the Toy Story movies. Perhaps watching one this weekend would be an excellent diversion. Andi sent a completely different take on the toys theme. 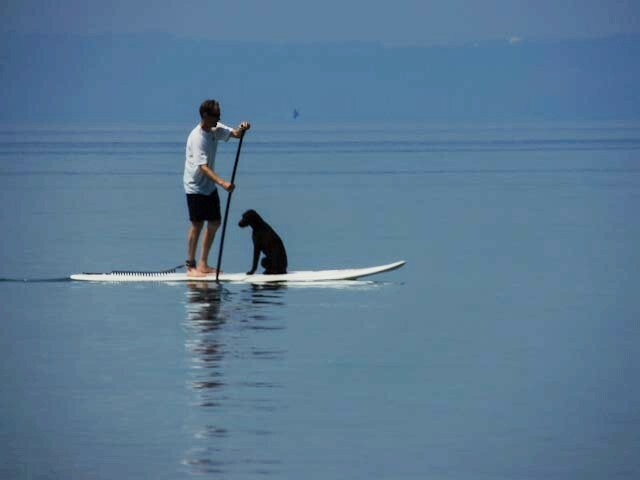 Maybe I could take Miss Sadie and the Cowboy for a ride on a stand-up board. Or maybe we should just go down to the beach and stand in the water, like our next subject. Bruce’s story—and he’s stickin’ to it—is this: A few evenings ago I heard the wail of bagpipes from the beach. I went to investigate. Although the sound seemed to come from nearby, it was coming from about a half mile away. 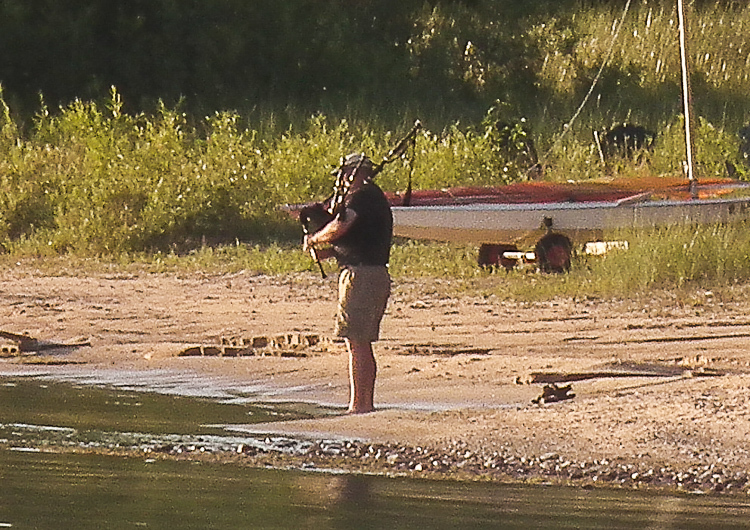 I walked in that direction and finally spotted someone who could have been a piper standing in the water. I used a long telephoto setting to take a shot. But then the wailing stopped. It wasn’t until I blew the shot up with my computer that I [knew I] had really taken a photo of the piper. I wish I’d been down there hearing the distant wail. Perhaps I might acquire a stand of pipes in honor of my Baird line. I could play them each morning, greeting the dawn as the sun lifts over the bluff. I will give you fair warning about the last of the photos. 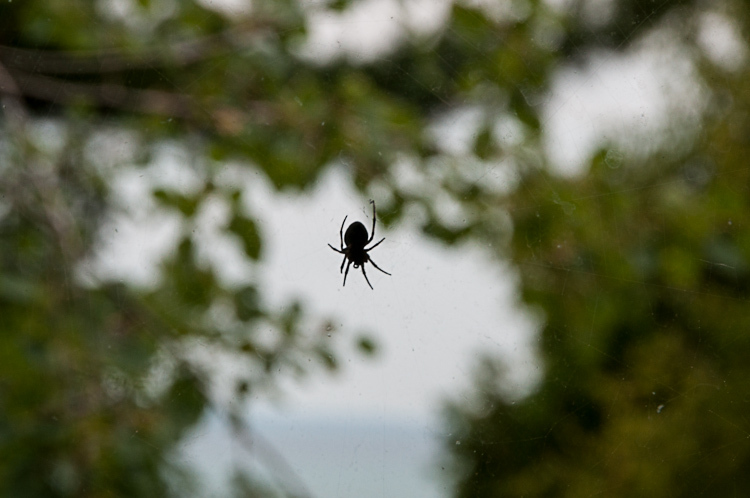 It’s a very small spider, an eensy-weensy spider really, but I know how you are. Here you go. Bruce knows how you are, too, but it’s just such an intriguing little image, isn’t it? I was messing with different focus techniques, he wrote, and the result was sort of three dimensional. See? Just think of it as an exercise in photographic technique. If you’d like to examine it closely, just click on the photo for a larger version . . .
← Next – sparkly pink muskies? Oh that piper. What a delicious treat. I’d trade you hours on my scooter just to have heard him. OK, so I can get a really good scooter ride if I can just find that piper. I’m on the case. I have a blog friend in Florida who’s passionate about those stand-up boards. She calls them YOLO boards, for “you only live once”. Whether that’s a commentary on their safety or just a general nod in the direction of new experiences I can’t say. I am amazed at that dog sitting there so nicely. I’m sure they’ve had their moments. There’s a fellow around here who celebrates his birthday by being taken by boat up and down the channel. He stands on the bow with his bagpipes and plays “Amazing Grace”. I’ve never seen him, but several times I’ve heard his pipes. If the wind is right, I can hear them right here at home. Bagpipers seems to be – well, a different breed. But very nice. St. Thomas High School in Houston has an award-winning pipe band. When they show up at events here and there, they’re treated like rock stars. They really are wonderful, and it surely beats sitting home playing video games. Here’s a sample . Very fine pipers, those St. Thomas students. Stirring. And I’m a fool for pipers anyway. Still, I reserve my highest regard for the solitary eccentric spiraling an utterly untranslatable skirl into the sky. Restores my faith in the great mystery at the heart of the universe. I am wondering about pipes as an antidote to excessive fireworks. Oh my…so much to talk about here. First of all I have never seen any of the Toy Story movies either. Though I hear they’re good. And if you can find a stand up board I’m sure Cowboy would love to go for a ride. And my sister plays bagpipes..and is always looking for a place she can play. I have lots of stories about THAT…….and pipes are definitely an antidote to excessive fireworks. Take my word for it. This is like a community summer potluck. A little of this, a little of that, all of it reminding somebody of a story, which leads to another story, which often leads to a good recipe for an excellent treat. Ask your sister if she would like to bring her pipes up here during July. She could have room and board at the Writing Studio and Bait Shop in return for practicing the pipes and giving a concert. You can come too. We’ll rent Toy Story and see what we think. I’m thinking that even if I found a stand-up board I would probably have to find someone to take me for a ride on it. I’m pretty sure the Cowboy would come along. Miss Sadie would wait for us on the beach. Miss Puss – well, you know how she is. Great group of photos, and some fine fence-painting 😉 If I had a dog, I would love to take him/her along paddling with me. I live vicariously well enough, though, so I quite enjoy the photos of others and their pups. Bruce’s story makes my day. It’s pretty early though, as we were out late taking in the (excessive? okay, if you count all the non-planned ones I suppose) fireworks. I think that fence would meet with Aunt Polly’s approval. Bruce and Andi are always good for a fresh coat. I have not seen “Toy Story,” either, Gerry. Love the dog on the board! Love the piper and the spider, too, but the dog most. As for lemonade, a Northport friend recommends straight lemon juice (he buys it by the case and drinks a quart a day) for dissolving bladder stones, should you or anyone else ever be troubled by those. His urologist can scarcely believe the results of this regime. Doctor had offhandedly suggested the sufferer might try lemonade, but our friend scoffed at that idea and went for the strong stuff. I realize this is pretty off the subject but thought some of your readers might be interested. The lemonade story is interesting. I am positive that there are things in food–especially the acidic foods–that have specific effects on our bodies. I’m pretty sure, too, that we can go overboard. Back in the day, when I was in the throes of 24/7 morning sickness, there were three categories of food I could eat and keep down: tomatoes, oranges, and Mexican cuisine. After awhile I developed an astonishing case of hives, which was attributed to excessive tomatoes. I had to give them up for the duration. They’re back in rotation now, of course, but in moderation. Except for when they’re at the peak of perfection in local gardens, when an astonishing case of hives would be a price worth paying. I have some friends who are Bairds. I’m an Alexander myself, which is a sept of MacAlister. And I will (& have) followed the sound of the bagpipes anywhere! I will not promise to follow the pipes just anywhere, as I have observed that they go to some pretty scary places, but I will listen, indeed I will. Oh Gerry what a hot post! So many memories and merriment. My teenager and his mate have been whooping YOLO for days, I didn’t know what it meant! the sound of the pipes sent the foe running home in search of their mothers!! Now that cheered me up. Do you suppose students take up the pipes just to annoy their parents? Being able to annoy the neighbors as well is just a bonus. I wonder if it’s too late for me to take up piping. YOLO! The dog on the board gave me a chuckle. I took a picture of a funny dog this past weekend, although not one of my own surprisingly enough. We went camping, and I took a photo of a dog paddling along side while its person paddled a kayak. I don’t know if that was the way the dog preferred it, or if that was just the way it was. In my experience, any kind of retriever wants to be in water, end of story. If nothing else presents itself, a puddle will do. A terrier, on the other hand, is happy to sit on the beach and look at the water. Sip a cool drink. Move to a patch of shade when it gets too warm. I have been a retriever and I have been a terrier, and I must say retrievers have more fun. Terriers get less sunburn. My neighborhood had more than one bagpiper practising in the backyard after supper. I hadn’t thought of that for years. Woody, however, was in my room just this week along with Jessie the Yodeling Cowgirl, brought in by a 4 year old girl for our make-believe theme. He’ll probably be back for an encore this week as we explore the Wild Wild West. I hope you get to see at least one of the movies. They’re all pretty good. I thought I would go rent one of the movies so that I could write an intelligent answer but I never got around to the rental and we will have to make do. It occurs to me that I would be very interested in a Canadian perspective on the Wild Wild West. I suspected Alberta figured into it. I visited Calgary one September, some 15 years ago. Definitely Cowboy Country. It felt a lot like Denver, and a lot like Detroit (for complicated reasons, but remember, I love Detroit). The rooftop gardens were quite a surprise. The prairie wasn’t. The city ends and the prairie goes on forever. What a pleasant conversation at Torch Lake’s ! I have been away for a while and feel happy to be back here, Gerry. The picture of the dog sitting quietly on the board is precious. Can you imagine a beagle doing the same thing ? I cannot, at least mine. As for the bagpiper…during the celebration of one of my birthdays (a particularly striking one) we all had the immense surprise to hear a bagpiper playing “Amazing Grace” very close to our home. We went in the garden and saw one of my nephews walking slowly towards our house as he was playing. I never forgot this sight. Nor did the neighbours in the street who were following him with great curiosity and respect. What a present Vincent offered me ! Nice to see you here, Isa, and to think of Nino. No, I cannot imagine him sitting quietly. I can imagine him moving busily across the beach with the Cowboy and Miss Sadie, nose missing nothing.